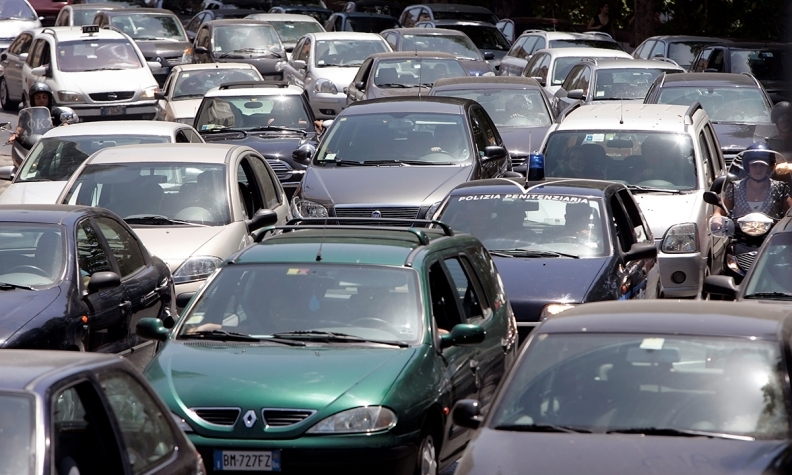 Cars are seen stuck in a traffic jam in downtown Rome. ROME -- Rome, one of Europe's most traffic-clogged cities and home to thousands of ancient outdoor monuments threatened by pollution, plans to ban diesel cars from the center by 2024, its mayor said. Virginia Raggi announced the decision on her Facebook page on Tuesday, saying: "If we want to intervene seriously, we have to have the courage to adopt strong measures." About two-thirds of the 1.8 million new veicles sold in Italy last year were diesel, according to industry figures. Rome has no major industries, so nearly all of the air pollution in the Italian capital is caused by vehicles. Apart from health issues, pollution from combustion engines causes severe damage to Rome's many ancient outdoor monuments. Ahead of celebrations marking the start of the new millennium in 2000, the darkened facade of St. Peter's Basilica at the Vatican was cleaned as part of a project that lasted several years. Before the German court's ruling on Tuesday, officials in highly industrialized Milan, in northern Italy, had already announced plans to make the city diesel-free by 2030.